This week, we saw two FCS football programs punch their ticket for the FCS Playoffs. To few people’s surprise, undefeated 9-0 (6-0) North Dakota State made what was formally assumed now for weeks, clinching their autobid to the FCS playoffs with a bitterly-fought 17-7 win over Youngstown State. To even fewer people’s surprise, undefeated 8-0 (5-0) Colgate also resoundingly made sure they were headed back to the FCS playoffs with a 41-0 win over Fordham, their third consecutive shutout and their seventh straight game not allowing a touchdown. The question is, who will the other twenty-two teams be? Absolutely nothing is settled in a multitude of conferences, including the CAA, Southland and SoCon, where it feels like almost the entire conference is alive for the postseason. Who are the frontrunners, and who will fall just short? Big Sky: 8-1 (6-0) UC Davis did not falter at home this week vs. Northern Arizona, taking care of business to the tune of a 42-20 victory. A huge game looms this week against 7-2 (5-1) Eastern Washington, who is also still in contention for the autobid and conference title. An Eastern Washington win would open up a variety of scenarios for either the Eagles, Wildcats or Bengals to win the autobid. Idaho State has the weakest hand, but it boils down to all three of these teams would need to continue winning and receive some help to win the autobid. Big South: In contrast to the confusion in the Big Sky, the Big South’s championship and autobid determination couldn’t be simpler. 8-1 (4-0) Kennesaw State faces 7-2 (3-0) Monmouth at home this weekend. If the Owls win, they’re the champs, and they’re in the playoffs. If Monmouth wins, it could come down to 3-6 (2-1) Gardner-Webb. A Monmouth win and a Gardner-Webb loss has Monmouth clinch this week, otherwise it could come down to a season-ending game between Monmouth and Gardner-Webb to determine the champion. Colonial Athletic Association: With three teams at 5-1 in conference play and three more at 4-2, good luck in trying to find out who will win this autobid, especially since some of the teams in contention haven’t played each other head to head. The team marginally in the driver’s seat is 6-3 (5-1) Maine, who close the year on the road against Richmond and at home against 6-2 (4-1) Elon. It’s not like the road is much easier for 7-2 (5-1) Delaware, who head to 6-3 (4-2) Stony Brook this weekend and finish against Rival Villanova. 6-3 (4-2) James Madison plays 6-3 (4-2) Towson as well to close the year, making this a real head-scratching proposition as to who might win the autobid or even end up with seven wins. Missouri Valley:9-0 (6-0) * North Dakota State clinched the Missouri Valley Conference football title this weekend. Sharpie. Northeast: 6-3 (4-0) Sacred Heart kept their party rolling in the NEC this week with a 38-7 thumping of Robert Morris. A stern test awaits the Pioneers in Pittsburgh this weekend against 6-3 (3-1) Duquesne this weekend. If Sacred Heart wins, they are the NEC champs, having beat both Duquesne and 5-4 (4-1) Central Connecticut State, the only teams that could catch them. If the Pioneers lose, it will come down to the final weekend. Ohio Valley: Two teams with losing records are the only thing keeping 7-2 (5-1) Southeast Missouri State from the OVC title: 4-5 (4-2) Murray State and 2-7 Eastern Illinois. If they win both, they will be the OVC champions. If they falter, it opens the championship and autobid to someone familiar, 7-2 (6-1) Jacksonville State. It’s going to be an interesting last couple of weeks, I think. 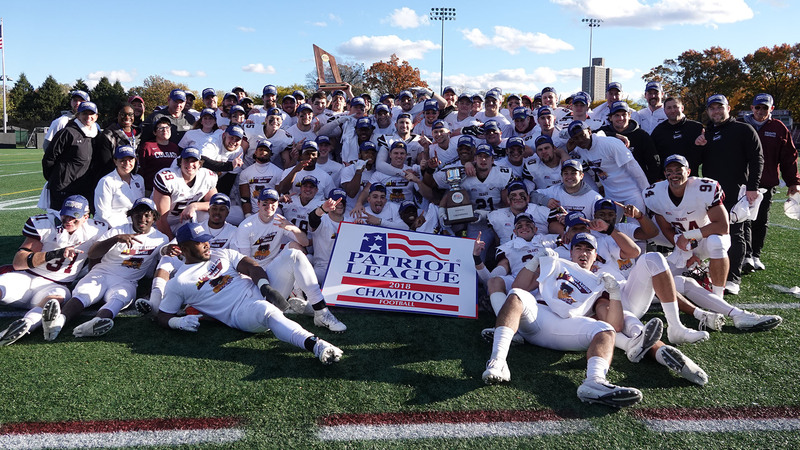 Patriot League: 8-0 (5-0) * Colgate clinched the Patriot League football title this weekend. Sharpie. Pioneer: 7-2 (6-0) San Diego continues to roll, beating Drake this week 27-10. If the Toreros defeat 5-4 Davidson at home this weekend and Drake beats 5-4 (5-1) Marist, San Diego will be the Pioneer Football League champions. If both the Toreros and Red Foxes win, it will come down to a play-in to the FCS playoffs the following week in Poughkeepsie, NY. Southern: With the upset of 6-3 (5-2) Wofford this week, all eyes go to 5-4 (4-2) Samford this week. If the Bulldogs take care of business against The Citadel, that would make their season-ending game against 8-2 (6-1) East Tennessee State the SoCon title game with an autobid on the line. If that happens, pretty much every at-large team will be an ETSU Bucaneers fan – Samford’s only path to the FCS playoffs seems to be winning their last two games. If they finish at 6-5, it feels like they’re out. Southland: Let’s just face facts – nobody, not even the folks in the Southland League office, have any clue how all the championship and autobid scenarios might play out. Three teams at 5-2 in the conference and four more at 4-3 – good luck figuring it out. It’s entirely possible that 4-4 (4-6) Southeastern Louisiana State is still alive for title consideration. I’m not sure. The team that could really help everyone out is 6-3 (5-2) Nicholls, who have what seems to be the path of least resistance to a 7-2 conference record with games against 2-6 Stephen F. Austin and 4-6 Southeastern Louisiana to go. It seems like they have the best shot, but it’s hardly a done deal. Technically they are not in control of their own destiny. 6-3 (5-2) McNeese State wins the autobid if they, Nicholls, and 5-4 (5-2) Incarnate Word win their remaining Southland games. But it’s tricky. If McNeese State and Incarnate Word win out but Nicholls loses once, Incarnate Word would win the championship and autobid, because they beat McNeese head-to head. If no team ends with fewer than three conference losses, it becomes the hottest of messes, with 5-4 (4-3) Lamar, 5-4 (4-3) Sam Houston State, 5-4 (4-3) Central Arkanas, and 5-4 (4-3) Abeline Christian in the mix too – IF they win out – and the tiebreaker scenarios applied to all of them equally. While we wait for this mess to sort itself out this week, we’re going to just pencil in “Nicholls” right now and wait and see if a team like Lamar can crash the party. It will be fun to watch. After the FCS Playoff committee released their Top 10 teams last week, we have an extra data point to determine our seedings. James Madison’s upset loss will undoubtedly drop them in the seedings. They were initially seeded No. 2. For the record, I do not agree with the FCS Playoff Committee that Kennesaw State should be sixth. I feel they are certainly a Top 5 team and should be ranked ahead of every Big Sky team, including UC Davis. I also feel that, at most, there should be two Big Sky teams as seeds. But I have to switch my seedings to what I think the Committee will select. Monmouth of the Big South and North Carolina A&T of the MEAC are the most interesting inclusions. I feel like an 8-3 Monmouth, with no big quality wins but a loss to and FBS team and (potential) losses to two of the FCS’ best teams, is very close to making it in the field. But their resume is just barely not good enough to make it just yet. And a North Carolina A&T team that wins the rest of their games, yet still finishes behind Florida A&M for the MEAC title (and slot in the Celebration Bowl), has to be a strong candidate for an at-large bid, thanks to their win over Jacksonville State to begin the season. In the CAA, there are two teams that are 5-1 (Delaware and Maine) and one that is 4-1 (Elon). Since win-loss percentage is what determines the conference winner Elon needs help. Elon is short a game as they had a game canceled against William and Mary due to the hurricane. Additionally, whoever gets that title will get a bye in the first round.